Wood River Valley jeweler Christina Healy is being honored by the Sun Valley Lodge Gift Shop as its exclusive jeweler for more than two decades. Courtesy photo. The Sun Valley Lodge Gift Shop will honor Wood River Valley jeweler Christina Healy at a champagne reception today, Feb. 25, from 4-6 p.m., at the gift shop. 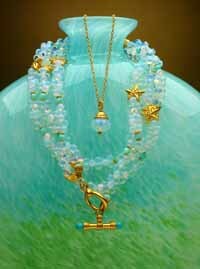 Healy has been the exclusive jewelry designer for the shop for 26 years. The Expedition Inspiration Fund for Breast Cancer Research 15th annual Laura Evans Memorial Breast Cancer Symposium will take place March 2-6 at Sun Valley Resort. Breast cancer research scientists from around the world will attend the symposium, "Successes of Translational Research in Breast Cancer." The meeting will be chaired by Expedition Inspiration scientific advisor Dr. Marc Lippman, one of the country's leading authorities in the field of breast cancer. Expedition Inspiration will host a free community open forum, held in conjunction with the symposium on Thursday, March 3, in the Continental Room at Sun Valley Inn from 5-7 p.m. The open forum will present "Meet the Experts," when participants will offer insight into their areas of expertise. The forum will also have a Q&A session. Expedition Inspiration will also present its 2010 Young Investigator Awards at the open forum. Chloe C. Milsom, Ph.D., is the recipient of Expedition Inspiration's annual Brenda M. Williams Young Investigator Award for Breast Cancer Research. She conducts her research at the Sunnybrook Health Sciences Centre in Toronto. Toby M. Ward, Ph.D., University of Miami, was also a 2010 Young Investigator Award recipient. Both will speak about their research projects, which Expedition Inspiration is supporting. For details, call 726-6456, e-mail ei@expeditioninspiration.org or visit www.expeditioninspiration.org. The ninth annual Sawtooth Ski Festival will take place Saturday, March 5, through Sunday, March 6, in the Stanley Basin and Sawtooth Valley. Presented by the Sawtooth Ski Club, the festival will have a fundraising event on Saturday with a Park Creek Poker Run and Chili Feed from noon to 2 p.m. for skiers and snowshoers at Park Creek. For details and to volunteer, call (208) 774-2251. A silent auction, music and dinner extravaganza will take place on Saturday at 5:30 p.m. at the Stanley Community Building. For details and to donate items, call (208) 774-3487. On Sunday, ski, feast and chat at Alturas Lake Ski Trails for the Soup Kitchen Social, from 11 a.m. to 3 p.m. For details, call (208) 774-3487 or visit www.sawtoothskiclub.com.